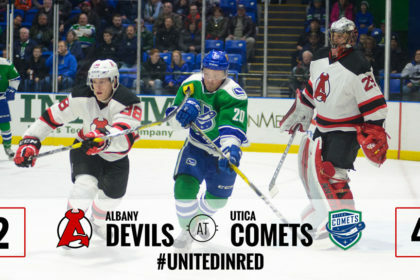 UTICA, NY – The Albany Devils’ four-game win streak was halted when they fell to the Utica Comets, 4-2, Friday at Utica Memorial Auditorium. 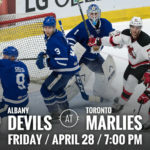 Max Novak and Blake Coleman netted the two Albany tallies, who moved to 20-14-0-1. 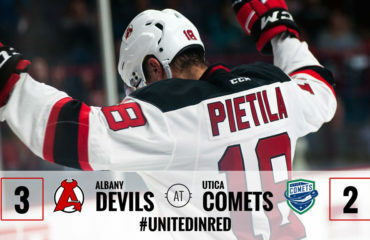 Utica advanced to 11-15-5-1. 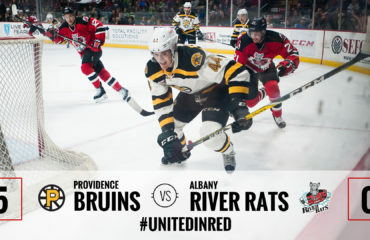 Colby Robak got Utica on the board first with a power play goal at 6:07 of the first period. Max Novak evened things up at 15:45 of the first, capitalizing off a Blake Coleman effort and getting the rebound in the crease. Novak’s goal was his fourth of the season and came on a power play. Coleman and Reece Scarlett picked up the assists. 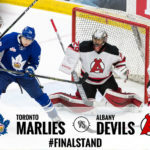 At 13:10 of the second period, Alexandre Grenier found the back of the net after a dump-in by Darren Archibald ricocheted off the glass and dropped into the slot. 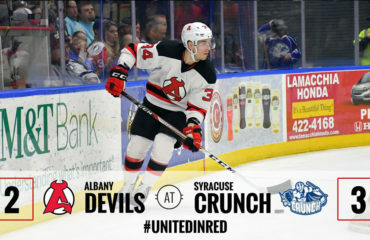 Just 14 seconds into the third period Curtis Valk received a feed from Archibald and netted another Utica goal, making it 3-1. 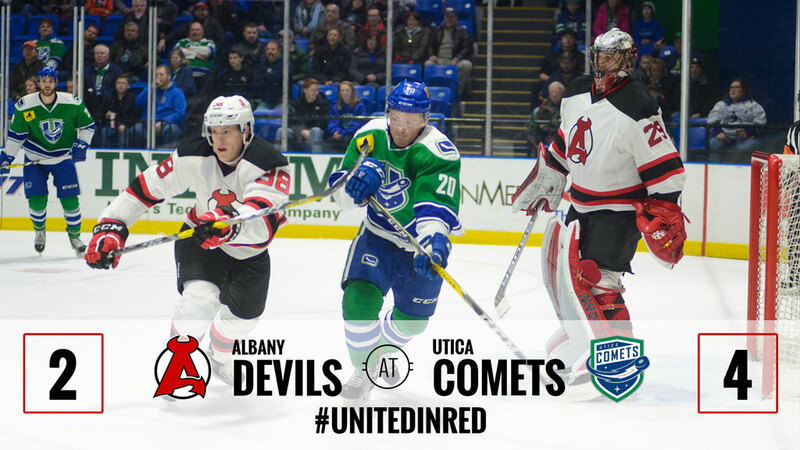 Blake Coleman answered back for Albany after being fed a pass by Carter Camper, cutting the score to 3-2 at 11:54 of the third. 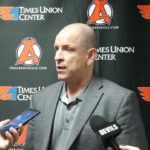 Jacob MacDonald got the second assist and earned his first ever AHL career point. Utica’s Wacey Hamilton got the final tally of the game off an empty net goal at 18:31 of the third. Mackenzie Blackwood faced 31 shots, saving 28, and moves to 7-7-1-0. 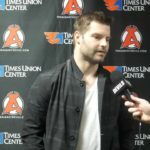 Utica’s Richard Bachman turned aside 23 of 25 shots. His record improves to 4-6-1-0. 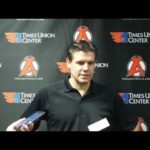 The Devils travel to Lehigh Valley for a 7:05 pm puck drop against the Phantoms Saturday at PPL Center.